When it comes to shoes, I'm a loyalist. I may own approximately one zillion pairs, but they all tend to fit into a few choice categories I know I'll get plenty of wear out of—even if those moments arrive at different points of the year. I've been known to get sidetracked temporarily (I had to buy Velcro hiking sandals for a trip to Sri Lanka and didn't enjoy the purchasing process), but otherwise, things stay the same year in, year out. During the winter months, I'm a dedicated stretchy-boots wearer, choosing knee-high and over-the-knee styles in different shades to go with anything and everything. I even layer them under wide-leg, cropped trousers for extra mileage. When spring hits, I'm keen to lighten things up, and this year, there are some old favourites (such as low-heeled mules with closed toes, because some days are not open-toe–appropriate) as well as newer, more on-trend entry (welcome back, strappy sandals). Keep scrolling to see which styles I always swear by in spring, and then shop some of my favourites. Somehow, just getting rid of the back of a shoe suddenly makes one feel like the depths of winter are far gone and warmer months really are on the horizon. 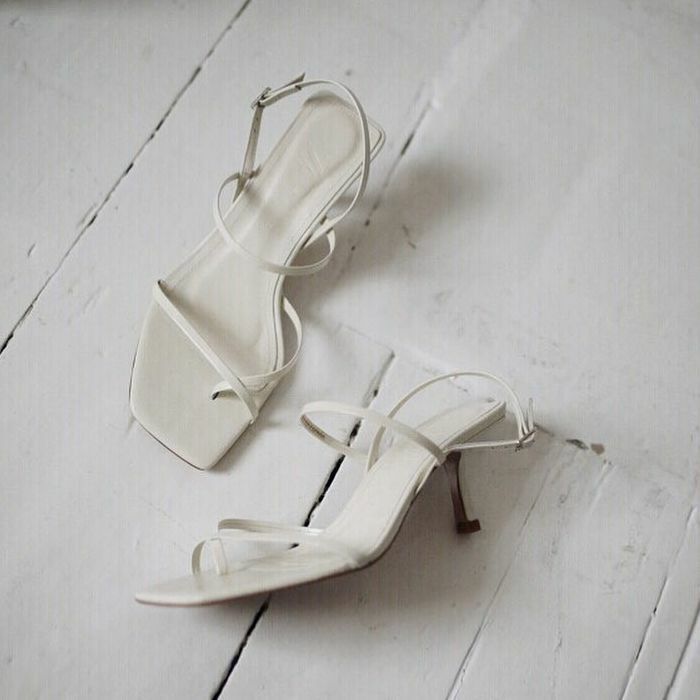 They may not be the shoes you spend all day, every day pounding the pavements and stomping around your office in, but they are the most of-the-moment shoe trend for 2019 and particularly great for a party, dinner or wedding. Such is the strappy sandal's strong allure that I already have a red pair from Topshop and a white version from Zara. Whoops. If it's still not the time for sandals and still risky to even consider baring one's heels, then I'd always opt in for a pair of lighter-coloured boots—either cream, tan or white will do nicely, and I think that suede finishes always look a bit more casual and summer-appropriate than leather.